Ready to go through that box of old family photos? This is the type of task that looks deceptively easy, but can actually be really time consuming. 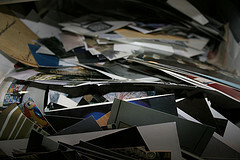 Fortunately, there are several tips that will help you to efficiently organize all those family photos. Break the task into small pieces. You aren’t going to be able to sort out an entire box of old family photos, identify all the people in them, label them, and scan them into your computer in one night. Breaking the process down into smaller goals can help prevent the task from feeling completely overwhelming. First, focus on sorting out the photos. This will probably take more than one evening. Some labeling can happen as you sort, and the rest can be done later on. Put off scanning the photos into your computer until after you have gotten them all labeled and sorted. Get some manila envelopes. Label one “I know who this is”. Flip those photos over and use a pencil to jot down the names of the people who are in each photo. Label another one “I have no idea who this is”. Toss in the ones that are mysteries that you can spend time unraveling later. The third manila envelope is for photos of people who you do not immediately recognize but suspect you might be able to guess the identity of. Label it “I might know who this is”. Could that person be aunt Martha? Maybe. Toss that photo in the third manila envelope. You have already gotten started on this step. You recognized a person who was in a photo, and you wrote down his or her name on the back of it. Shift your focus to the other two manila envelopes of photos. Bring these batches of photos to your relatives. Ask if they recognize anyone in the photos. It is possible that someone knows exactly who those mystery photos are of. Now is a good time to ask for more details about that person (such as birth and death dates, or family stories). Make sure you write the person’s name on the back of the photo so you won’t forget it after you get home. You have worked through the previous steps and identified many of the photos that were sitting in the box. There will be some left that you do not know any information about. Select one of those photos, and try and dig up some information about that person. It is time to do some serious genealogy research. The photo itself may give you some clues. How old does it look? Is it in color, or black and white? The type of clothing that the people who are in the photo are wearing may give you a hint about what decade (or century) it was taken. Image by Orin Zebest on Flickr.